Avenches has an interesting Roman Museum in a medieval tower right next to the Roman amphitheater still used for concerts and festivals. Avenches, then known as Aventicum, was the capital of Helvetia (present-day Switzerland) during most of the Roman era. The town has some Roman ruins that are worth seeing but the main attractions are the Roman amphitheater and the adjacent Musée Romain. The top exhibit is a valuable golden bust of Emperor Marcus Aurelius. 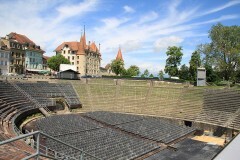 The amphitheater in Avenches is well preserved and restored and a popular venue for spectacular open-air concerts. These range from an opera festival (July) to rock concerts. Reservations are usually possible via the tourist office. The amphitheater is freely accessible when no performance takes place. 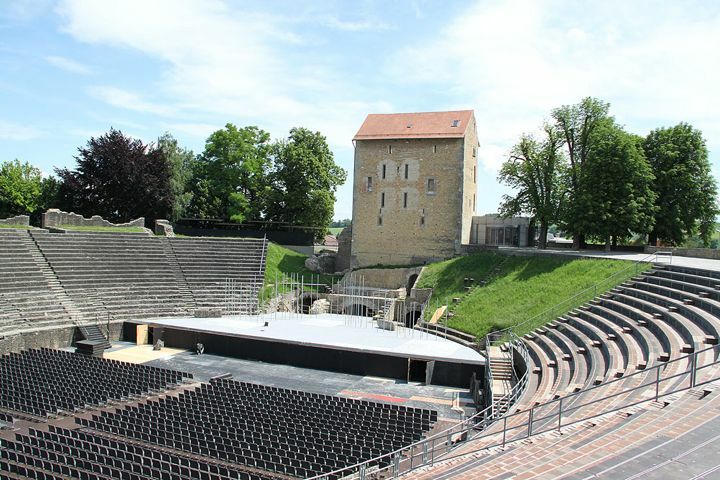 The Musée Romain in Avenches is in a five-story medieval tower overlooking the amphitheater. In the cellars the original Roman outside wall of the amphitheater is clearly visible but much of the tower is from the eleventh century with further additions after the Bernese took over (1536 to 1803). Although spread over five floors, the Musée Romain is not unmanageable big – it is fairly small and easy to enjoy. Descriptions are mostly in French and German only but a very comprehensive English flyer may be loaned from the reception. The museum has the usual collection of Roman objects found in the city including statues, mosaics, needles, household objects, and coins. However, it also owns a magnificent golden bust (around AD180) of Marcus Aurelius. Unfortunately, the bust is so valuable that it exceeds the capabilities of the security system of the museum – only a copy is on show with the original in a bank vault in Lausanne. In the cellar, Roman and Roman-related games are available to entertain (predominantly) children. A video explains more about the excavations in the Avenches region. A wide range of books are on display including detailed studies of the golden bust of Marcus Aurelius, which was only discovered in 1939. Admission is CHF4 for adults and free for children under 16 (CHF2 for school groups). 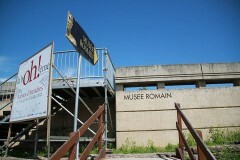 A combination ticket with the Roman Museum in Vallon is CHF8. The Swiss Museum Pass is valid. Pick up a free flyer in the museum with map and walks of the Roman ruins next to the town. A separate flyer offers the same for medieval sights. Also see Roman and Medieval Sights in Avenches for more information on further sights in the town and its long history. The Roman Museum in Vallon is a short drive away and has the largest Roman mosaic ever found in Switzerland – it is in a remarkably good condition and still in its original position.